The Entities plugin will automatically find company names, place names (in multiple languages! ), numbers, or just unusual words that aren’t in the dictionary. Like all plugins, it’s available under Add View. Overview’s entity detection algorithms are designed to err on the side of including things that aren’t entities, rather than missing things which are — unlike normal NLP techniques which often miss 50% of entities. You can hit the little red X’s to remove junk from the list. Overview will automatically OCR any PDF which doesn’t seem to have any text in it, such as scanned pages, using the open-source Tesseract engine. Scanned documents will be much slower to load — but you won’t be able to search them until you OCR them somewhere, so why not let Overview do it? If you’d like to get OCR’d files out of Overview, you can simply export the documents after Overview has loaded them. You’ll get searchable PDFs back. You can use the delete tool to remove the words that aren’t adding anything. When you remove words, less common words are added to fill up the space. This way you can zero in on exactly what you want to investigate. You can have more than one word cloud at a time, through the Add View menu. Press the Hidden Words button to unhide words. You can export all documents or just the result of the current search. For example, you could download only documents with the word “pizza” in them. And you can export either one document per file, or just the text (and any custom fields) as a CSV. This means you can use Overview as a text extractor: upload random files, download a clean spreadsheet of the text. Or an OCR machine: upload random files, get searchable PDFs back. Overview now supports custom fields, or as we like to call it, document metadata. You can add a field and set the value for all documents in a batch import. Or you can edit the fields on one document at a time in the document viewer. If you add a field to one document, it will appear (initially blank) for all documents. Or, if you load your documents via CSV, Overview will read in each extra column as a field. Each field will be its own column when you export as a spreadsheet. Starting today Overview has two new plugins pre-installed on overviewproject.org. You can access both through the Add View menu. WordCloud is just that. You can click on a word to select all documents containing that word. Multisearch looks for many search terms in all documents at once. You can add items one by one, or click Edit entire list as text to paste in lots of search terms at once. After you’ve added a search you can edit the query by clicking the Edit link to the right. In this example, the search named “environmental” actually searches for “environmental OR environment”. You can also do fuzzy searches by adding a ~ (tilde) to the end of the query, like “Obama~” which can be incredibly useful for searching through documents that have been poorly scanned and OCRd. Multisearch supports the same advanced query syntax as Overview’s regular search. Both of these plugins were written using Overview’s new plugin development API, and you can write your own! Starting today, you can directly upload documents in a wide variety of file formats. Simply add the files — or entire folders — using the usual file upload page. Note that the “Add all files in a folder” button is only available when you are using the Google Chrome browser, due to limitations in browser support for this feature. For a full list, see the file formats that LibreOffice can read. Overview’s tags are very powerful, but it may not obvious how to use them best. Here’s a collection of tagging tricks that have been helpful to our users, from Overview developer Jonas Karlsson. If you are working together with other people to review documents, you can add a tag called “In review by XY” when you start reviewing a folder. When review is complete, add the “Reviewed by XY” tag, and remove the “In review” tag. If the documents being reviewed by different team members overlap, these tags will make it easier to avoid duplicate work. Color code tags with the same or similar colors, to indicate similar concepts. Use long tag names, to make selection less error prone (no accidental hitting the + or – buttons). To change tag colors or names, open the Organize Tags dialog box by clicking on the link at the bottom of the tags pane, then click on the tag name or color to change. You can load this data into another program to visualize it. This is how Mick Conroy of TemperoUK created this analysis of the social media conversation around drones, by importing the tag data into this visualization software. Create a new tag “a or b or c”. All “a” documents should now have this tag. Add the “a or b or c” tag. Using the second procedure above, create a “not a OR not b OR not c” tag. There are different ways to get your documents into Overview. This post is about loading documents into Overview using the file CSV file format, and the format that Overview expects. text — this is the only required column, and must contain the document text. title — This is displayed when viewing the document. Documents are sorted by title in the document list. url — If the URL begins with https Overview will display the page when viewing the document. Otherwise Overview will display the plain text and a source link. id — ignored by Overview, but saved when the document set is exported, so you can match against other tables. tags — a comma-separated list of tags applied to each document. Great for comparing text to data. Every other column will appear as editable document metadata. The “text” column must exist. (It may also be named “snippet” or “contents” for compatibility with files exported by Radian 6 and Sysomos). All other columns are optional. Need more details? Read on. Many programs can save a CSV file. For example, Excel can save a spreadsheet as a CSV file. Be sure to include the column names in the first row. You can also export a CSV file from a MySQL database. Overview can probably read just about any CSV file created with any program, if you can ensure that the header is right. You may need to rename existing columns to the names that Overview expects, or you may need to add the header row entirely because some programs do not write a header. To do this, edit the CSV file with any text editor such as Notepad or TextEdit — but not Microsoft Word, as you will probably break the CSV file if you try to edit it in a word processor. This is the content of the first document. Document three talks about quick brown foxes. If the text of a document spans multiple lines, or itself contains commas, then it needs to be quoted. Quotes inside a quoted document must be “escaped” by turning them into double quotes. This is all standard CSV stuff, and any program or library that writes CSVs should do it automatically. commas, which is why it is quoted." The second document ends with this final quote." The third document fits all on one line so no quotes needed. "The fourth document has a comma in it, so it's quoted too." There are three more columns that Overview can read. You can add a “title” to each document, which Overview displays in the document list. Documents are sorted by title, so this is a way to control the order that documents are listed. You can add a unique ID column, simply named “id”, which Overview will read and associate with the document, and export with the document set. And you can add a comma separated list of “tags” if you want to import documents with tags already applied, or want to compare text to data. The columns can be in any order; all that matters is that the order of the column names matches the order of the data. Every other column will appear as editable document metadata. When Overview exports a document set, it writes out id, text, title, url, and tags fields, as well as any other fields you imported, or created within Overview. After these checks you will see the usual import options, then a preview of the file contents. You may need tell Overview what character encoding the file uses. Try changing this if you see funny square characters in the preview, or accents aren’t displaying right. Then hit upload, and away we go. Four of the winners and finalists of the 2014 Pulitzer prize in journalism were based on reporting from a large volume of documents. Journalists have relied on bulk documents since long before computers — as in the groundbreaking work of I. F. Stone — but document-driven reporting has blown up over the last few years, a confluence of open data, better technology, and the era of big leaks. What I find fascinating about these stories is that they show such different uses and workflows for document mining in journalism. Several of them suggest directions that Overview should go. We knew early in our investigation of Long Island police misconduct that police officers had committed dozens of disturbing offenses, ranging from cops who shot unarmed people to those who lied to frame the innocent. We also knew that New York state has some of the weakest oversight in the country. What we didn’t know was if anyone had ever tried to change that. We suspected that the legislature, which reaps millions in contributions from law enforcement unions, hadn’t passed an attempt to rein in cops in years. But we needed to know for sure, and missing even one bill could change the story drastically. Luckily, I’d been playing with Overview, a Knight Foundation-funded Associated Press project that highlights patterns within piles of documents. Overview simplified my task greatly — letting me do days’ worth of work in a few hours. Almost instantly, Overview scanned the full text of all 1,700 bills and created a visualization that split the bills into dozens of groups based on the most unique words that appeared in each bill. This gave me an easy way to skim through the bills in each group by title. Ultimately, Playford and Peddie were able to prove that lawmakers had never addressed the problem. This is a tremendous story, exactly the sort of classic accountability reporting that journalism is supposed to be about. The document mining process is particularly interesting because the reporters needed to prove that something was not in the documents, which is not a task that we envisioned when we began building Overview. But because Overview clusters similar documents, they were able to complete an exhaustive review much more quickly because they could often discard obviously unrelated clusters. The winner in the Public Service category was a blockbuster: The Guardian and The Washington Post won for their ongoing coverage of the NSA documents. Snowden has never publicly said exactly how many documents he took with him, but The Guardian says it received 58,000 at one point. This story typifies a new breed of document-driven reporting of that has emerged in the last few years: a large leak, already in electronic form, with very little guidance about what the stories might be. Finding what you don’t know to look for is an especially tricky problem with such unasked-for archives — as opposed to the result from a large FOIA request, where the journalist knows why they asked for the documents. Clearly you need software of some sort to do reporting on this type of material. Rukmini Callimachi of the Associated Press was a finalist for her stories based on a cache of Al-Qaida documents found in the remote town of Timbuktu, Mali. Thousands of documents were found strewn through a building that the fighters had occupied for more than a year. Unlike the digital Snowden files these were paper materials, several trash bags full of them, which had to be painstakingly collected, cataloged, scanned, and translated. Through these documents we’ve learned of Al-Qaida’s shifting strategy in Africa, their tips for avoiding drones, and that members must file expense reports. We had a chance to talk through the reporting process with Callimachi, and we’ve come to the conclusion that the bottleneck in such “random pile of paper” stories is the preservation, scanning and translation process. The reporters on the similarly incredible Yanuleaks documents — thrown into a lake by ousted Ukrainian president Viktor Yanukovych — face similar challenges. I still believe in the power of good software to accelerate these types of stories, but we need a breakthrough in workflow and process, rather than language analysis algorithms. Could we integrate scanning and translation into a web app? Maybe using a phone scanning stand, and a combination of computer and crowdsourced translation? The final document-driven Pulitzer finalist covered a black market for adopted children. Megan Twohey of Reuters analyzeed 5000 posts from a newsgroup where parents traded children adopted from abroad. I’ve started calling this kind of analysis a categorize and count story. Reuters reporters created an infographic to go with their story, summarizing their discoveries: 261 different children were advertised over that time, from 34 different states. 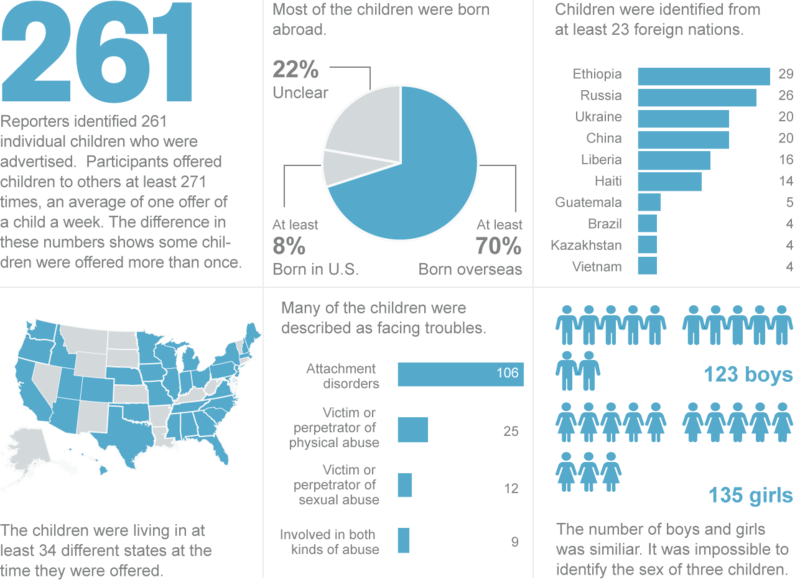 Over 70% of these children had been born abroad, in at least 23 different countries. They also documented the number of cases where children were described as having behavioral disorders or being victims of physical or sexual abuse. When combined with narratives of specific cases, these figures tell a powerful story about the nature and scope of the issue. 5000 posts is a lot to review manually, but that’s exactly what Twohey and her collaborators did. Two reporters independently read each post and recorded the details in a database, including the name and age of the child, the email address of the post author, and other information. After a lengthy cleaning process they were able to piece together the story of each child, sometimes across many years and different poster pseudonyms. There may be an opportunity here for information extraction or machine learning algorithms: given a post, extract the details such as the child’s name, and try to determine whether the text mentions other information such as previous abuse. But no one has really tried applying machine learning to journalism in this way. We hope to add semi-automated document classification features to Overview later this year, because it’s a problem that we see reporters struggling with again and again. I’m going to end with a guess: we’ll see several document-driven stories in next year’s Pulitzers, because we’ll see many more such stories in journalism in general. I make this prediction by looking at several long term trends. Broadly speaking, the amount of data in the world is rapidly increasing. Open data initiatives offer a particular trove for journalists because they are often politically relevant, and governments across the world are getting better at responding to Freedom of Information Requests (even in China.) At the same time, we’ve entered the era of the mega-leak: an entire country’s state secrets can now fit on a USB drive. Much of this flood is unstructured data: words instead of numbers. Some technologists argue that we can and should eventually turn all of this into carefully coded databases of events and assertions. While such structuring efforts can be very valuable, we can expect that unstructured text data will always be with us because of its unique flexibility. Emails, instant messages, open-ended survey questions, books: ordinary human language is the only format that seems capable of expressing the complete range of human experience, and that is what journalism is ultimately about. Meanwhile the technology for reporting on bulk unstructured material is improving rapidly. Overview is a part of that, and we’re aiming specifically at users in journalism and other traditionally under-resourced social fields. Between greater data availability and better tools, I have to imagine that we’ll see a lot more document-driven journalism in the future. To my eye, this year’s Pulitzers are a reflection of larger trends. UPDATE: we have installed our new SSL certificates. If you are an Overview user, you should have received and email asking you to reset your password, by clicking on the reset it link on the login form. Please reset your password! If you are concerned that someone may have gained unauthorized access to your documents, we can work you to audit our server logs to see if anyone who wasn’t you used your password. This completes Overview’s recovery from Heartbleed. You may have heard that, a few days ago, a serious bug called Heartbleed was discovered in a piece of the software that powers much of the web, including Overview. This bug could allow an attacker to intercept and decode secured connections to our server, and thereby gain access to your password and then your private documents. Due to the nature of this bug there is no way for us to know if any accounts have been compromised. We have already upgraded our servers so they do not have this vulnerability. Unfortunately, if anyone compromised our secure connections previously they may still be able to do so. We are working with our provider to get new SSL certificates to fix this problem. We are told this will take a few days. When this is done, we will send out a mass email asking everyone to reset their password. We apologize for the inconvenience. It’s a breathtaking bug, and we and the rest of the web are recovering as fast as we can. Here is my talk from the wonderful Groundbreaking Journalism conference in Berlin last week, plus the panel afterwards. This is a great short introduction to what the Overview Project has done, and where we are going — we see ourselves as a pipeline from the AI research community to usable applications in the social sector. Focus on a subset of your documents, such as those with a particular tag or containing a specific word. Use ignored and important words to try sorting your documents in different ways. This brings up a dialog box that looks very similar to the usual import options. You can name the tree (good for reminding yourself why you made it) and set ignored and important words to tell Overview how you want your documents organized in this tree. You can also include only those documents with a specific tag. To create a tree that contains only words matching a particular search term, first turn your search into a tag using the “create tag from search results” button next to the search box. Tags are shared between all of the trees created from a document set. That means when you tag a document in one tree, it will be tagged in every other tree. You can try viewing your documents with different trees, tagging in whatever tree is easiest to use. Who will bring AI to those who cannot pay? This line could not have been found through text search. It does not contain the word “police” or “body,” or the victim’s name or the date, and “Brentwood” matches too many other documents. Playford read the transcripts manually — it took weeks — because there was no other way available to him. But there is another way, potentially much faster and cheaper. It’s possible for a computer to know that “the incident in Brentwood” refers to the shooting, if it’s programmed with enough contextual information and sophisticated natural language reasoning algorithms. The necessary artificial intelligence (AI) technology now exists. IBM’s Watson system used these sorts of techniques to win at Jeopardy, playing against world champions in 2011. Journalism is not on this list. That’s understandable, because there is (comparatively speaking) no money in journalism. Yet there are journalists all over the world now confronted with enormous volumes of complex documents, from leaks and open government programs and freedom of information requests. And journalism is not alone. The Human Rights Data Analysis group is painstakingly coding millions of handwritten documents from the archives of the former Guatemalan national police. UN Global Pulse applies big data for humanitarian purposes, such as understanding the effects of sudden food price increases. The crisis mapping community is developing automated social media triage and verification systems, while international development workers are trying to understand patterns of funding by automatically classifying aid projects. Who will serve these communities? There’s very little money in these applications; none of these projects can pay anywhere near what a hedge fund or a law firm or intelligence agency can. And it’s not just about money: these humanitarian fields have their own complex requirements, and a tool built for finding terrorists may not work well for finding stories. Our own work with journalists shows that there are significant domain-specific problems when applying natural language processing to reporting. The good news is that many people are working on sophisticated software tools for journalism, development, and humanitarian needs. The bad news is that the problem of access can’t be solved by any piece of software. Technology is advancing constantly, as is the scale and complexity of the data problems that society faces. We need to figure out how to continue to transfer advanced techniques — like the natural language processing employed by Watson, which is well documented in public research papers — to the non-profit world. We need organizations dedicated to continuous transfer of AI technology to these underserved sectors. I’m not saying that for-profit companies cannot do this; there may yet be a market solution, and in any case “non-profit” organizations can charge for services (as the Overview Project does for our consulting work.) But it is clear that the standard commercial model of technology development — such as IBM’s billion dollar investment in Watson — will largely ignore the unprofitable social uses of such technology. We need a plan for sustainable technology transfer to journalism, development, academia, human rights, and other socially important fields, even when they don’t seem like good business opportunities.